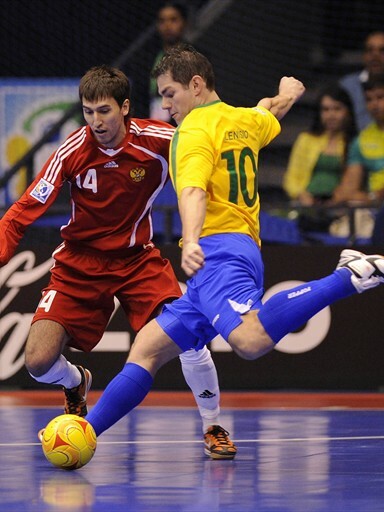 During my time in Brazil I was able to meet some of the stars of Brazilian and world futsal, and they don´t come much bigger than Lenísio Texeira. Regarded by many as the greatest player to play the game, it was a huge honour to chat with him. He is a very humble and friendly person and kindly did an interview for the blog. Lenísio played in some of the greatest teams of his generation in both Brazil and Spain such as GM/Chevrolet. He was a goal machine being awarded the Brazilian Championship’s top goalscorer 5 times, the first in 1997 and the last time in 2009. In the Spanish Championship he continued to be a nightmare for goalkeepers, achieving the same feat another 3 times in addition to being selected as The Player of the Season the same number of times. At national level he played in two World Cups, winning in his home country in 2008 where he was also the 3rd top scorer with 11 goals. He retired in 2012 due to repetitive knee injuries and is now the assistant coach to one of the best teams in the country, Corinthians. In this interview you will find his philosophy that these successes were built on. It is one that I share with him, to try to work with the best you can and to always try learn. Enjoy the interview! You and your brother, Vinicius, are two of the best players of all time. What do you think in your childhood contributed to you both developing into such special players? My brother and I believe that talent was important but also our dedication and our commitment to learning. We always sought to play and be with the ‘best coaches, best players and best teams’. That helped us a lot in our careers, to be with the best was very important. You played in Spain with two of the top teams at the time, El Pozo Murcia and Polaris World Cartagena. What did you take from this experience? It was great to play in Spain and I learnt a lot. I learnt a lot about the team game and importance of playing as a group. By being a ‘team’ you can achieve all your objectives. A golden generation in Brazil is coming to the end. Stars such as yourself, Marquinho, Vinicius, Schumacher and Falcao have retired or are nearing the end of their careers. Who will replace you and be the future stars? Brazil will always produce talented players. There are several players that are already there. How are you finding the adaptation from playing to coaching? My adaption to coaching was very smooth since my retirement was very well planned. I finished playing having accomplished all my dreams, goals and not missing anything. Now I know I have a long journey ahead, for this reason I am preparing myself. I’m studying, doing Physical Education at university and other courses. I approach my new life the same as when I was a player. I know that if I prepare myself well then I can achieve all my new dreams and new goals. Biggest Strength:I think it was my calmness and my desire to always learn. I never thought I knew everything and always wanted and tried to learn. Biggest Weakness:I think it was my marking. Favourite Season:The season and title most important was the 2008 World Cup in Rio de Janeiro. 1 Rule Change: Without doubt that the ball cannot go directly into the attacking half from the goalkeeper. It would have to bounce in the defensive half. Thanks for an excellent interview Lenísio and best wishes in your future career. Excellent interview Doug! Good luck Lenisio in your new career!